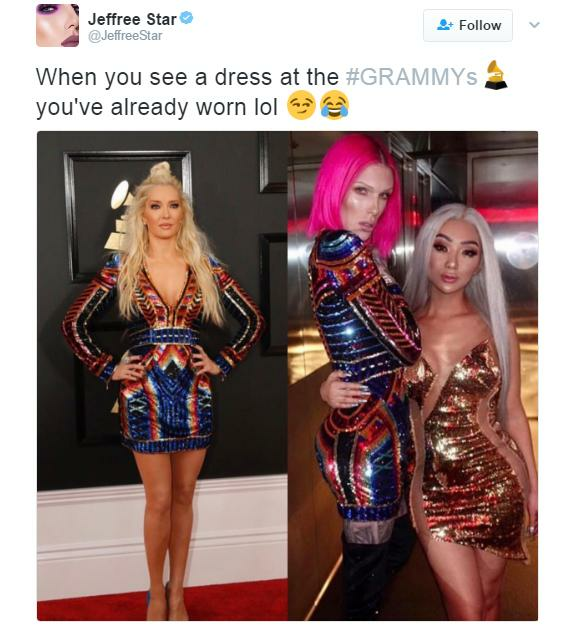 Jeffree Star is feeling the heat after a shady tweet about a Grammys dress led to the clapback of the year. The beauty guru took to his twitter account on Sunday to note that singer Erika Jayne happened to show up to the Grammy awards in a Balmain dress he had previously worn. While they both look amazing in the dress, Balmain is a popular designer and the dress wasn't couture, so the point of the tweet is unclear. The best response, however, was from Affinity Magazine, who pointed out the problem with Jeffree's logic. Jeffree's response was the internet equivalent of a shrug. Then people accused the magazine of acting unprofessionally, so they wasted no time in pulling out some crucial receipts from Jeffree's past. One time for the social media manager at Affinity. The magazine is referencing a (since deleted) video in which Jeffree joked about throwing battery acid on a black woman to lighten her skin tone. I personally find someone joking about throwing battery acid on a black woman far more unprofessional than pointing out an obvious fact. Well, I hereby find Jeffree Star sufficiently dragged. This round goes to Affinity Magazine. Let's keep it cute moving forward.